PENSACOLA, Fla. (Aug. 15, 2018) – Baptist Medical Group is pleased to welcome fellowship-trained and board-certified rheumatologist Eugene “Gene” Jalbert, D.O., MBA, to its multispecialty physician network. Dr. Jalbert is board certified in internal medicine and fellowship trained in rheumatology. He offers quality, convenient treatment to adult patients suffering from arthritis, osteoporosis and related aches and pains. Dr. Jalbert earned his medical degree at the Lincoln Memorial University – DeBusk College of Osteopathic Medicine in Harrogate, Tennessee, and completed his fellowship in rheumatology and residency in internal medicine at Nova Southeastern University – Largo Medical Center in Largo, Florida. 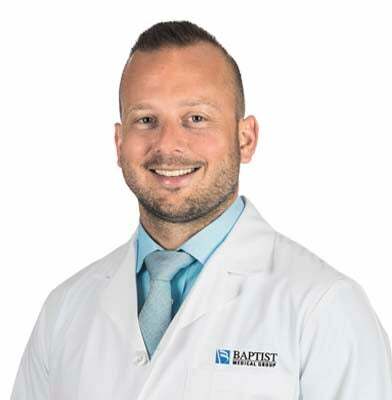 As part of Baptist Medical Group – Rheumatology, Dr. Jalbert is welcoming new patients at Baptist Towers, located at 1717 North E St., in Pensacola. To learn more about Dr. Jalbert or to schedule an appointment, please visit BaptistMedicalGroup.org.